A sensation on its publication in 1859, The Origin of Species profoundly shocked Victorian readers by calling into question the belief in a Creator with its description of evolution through natural selection. And Darwin's seminal work is nearly as controversial today. 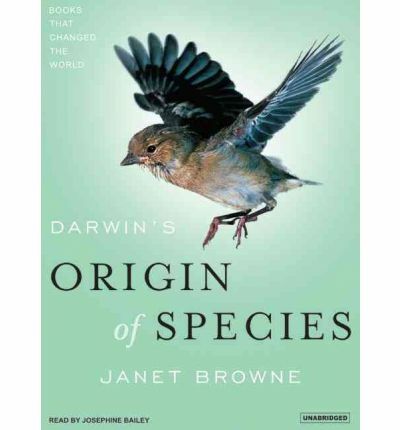 In her illuminating study, award-winning biographer Janet Browne delves into the long genesis of Darwin's theories, from his readings as a university student and his five-year voyage on the Beagle, to his debates with contemporaries and experiments in his garden. She explores the shock to Darwin when he read of competing scientists' similar discoveries and the wide and immediate impact of Darwin's theories on the world. As one of the launch titles in the Atlantic Monthly Press's Books That Changed the World series, Browne's history takes readers inside The Origin of Species and shows why it can fairly claim to be the greatest science book ever published. About the Author: Josephine Bailey was born in England and trained in performing arts at the Corona Academy in London. As a child, Josephine appeared in many feature films before going on to become a professional dancer. Returning to her love of acting has led to her recent performances for Hanna Barbera, Walt Disney and Nickleodeon.